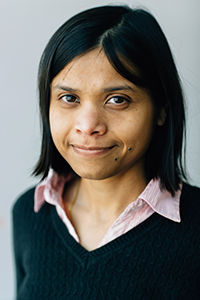 Sushmita Roy's research focuses on developing statistical computational methods to identify the networks driving cellular functions by integrating different types of genome-wide datasets that measure different aspects of the cellular state. Roy is interested in identifying networks under different environmental, developmental and evolutionary contexts, comparing these networks across contexts, and constructing predictive models from these networks. Estibaliz Larrainzar, Brendan Riely, Sang Cheol Kim, Noelia Carrasquilla-Garcia, Hee-Ju Yu, Hyun-Ju Hwang, Mijin Oh, Goon Bo Kim, Anandkumar Surendrarao, Deborah Chasman, Alireza F Siahpirani, R. Varma Penmetsa, Gang-Seob Lee, Namshin Kim, Sushmita Roy, Jeong-Hwan Mun, and Douglas R. Cook. Deep sequencing of the Medicago truncatula root transcriptome reveals a massive and early interaction between Nod factor and ethylene signals. Plant Physiology 2015 : pp.15.00350v1-pp.00350.(2015). Werner-Washburne, M., Roy, S. & Davidson, G. S. Aging and the Survival of Quiescent and Non-quiescent Cells in Yeast Stationary-Phase Cultures. Subcell. Biochem. 57, 123–143 (2012). Roy, S., Werner-Washburne, M. & Lane, T. A multiple network learning approach to capture system-wide condition-specific responses. Bioinformatics 27, 1832–1838 (2011). Rhind, N. et al. Comparative functional genomics of the fission yeasts. Science 332, 930–936 (2011). Davidson, G. S. et al. The proteomics of quiescent and nonquiescent cell differentiation in yeast stationary-phase cultures. Mol. Biol. Cell 22, 988–998 (2011). modENCODE Consortium et al. Identification of functional elements and regulatory circuits by Drosophila modENCODE. Science 330, 1787–1797 (2010). Roy, S., Plis, S., Werner-Washburne, M. & Lane, T. Scalable learning of large networks. IET Syst Biol 3, 404–413 (2009). Roy, S., Lane, T. & Werner-Washburne, M. Learning structurally consistent undirected probabilistic graphical models. Proc Int Conf Mach Learn 382, 905–912 (2009). Roy, S., Martinez, D., Platero, H., Lane, T. & Werner-Washburne, M. Exploiting amino acid composition for predicting protein-protein interactions. PLoS ONE 4, e7813 (2009). Roy, S., Lane, T., Werner-Washburne, M. & Martinez, D. Inference of Functional Networks of Condition-Specific Response–A Case Study Of Quiescence In Yeast. Pac Symp Biocomput 51–62 (2009).